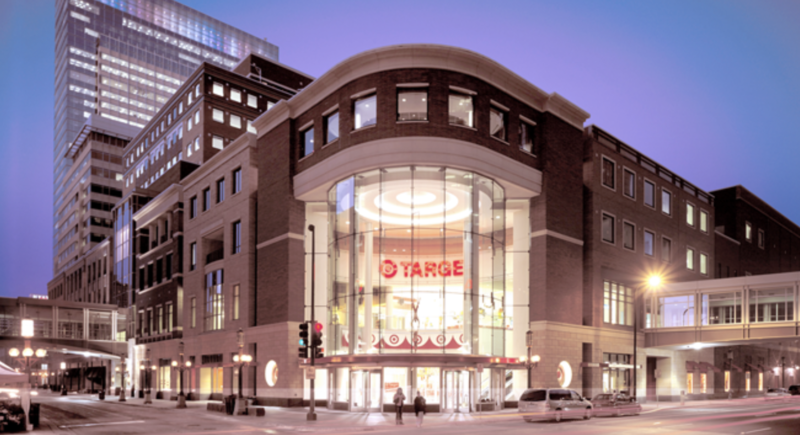 Target was founded in 1902 in Minneapolis, Minnesota, but the first discount Target store didn't open until 1962. Today, Target is one of America's largest retailers with annual sales of approximately $70 billion and more than 1,800 stores across the country. Target’s stores focus on convenient one-stop shopping and competitive discount prices, offering a broad range of product categories including personal care, beauty, electronics, apparel, food, furniture, appliances, baby care, movies, and much more. Approximately 33% of Target's revenue is generated from its own private label brands, and groceries account for 15% of total sales. Target’s typical customer is 40 years old, has a median household income of $64,000, and is more likely than not college educated. Target's historical success has been fueled by providing consumers with a wide selection of quality merchandise at very affordable prices, and a convenient, predictable shopping experience thanks to the company's nationwide reach of stores and well-known brand. As the second largest retailer in the country, Target's economies of scale enable it to negotiate more favorable supply contracts with buyers, keeping its prices low. Smaller rivals are unable to match Target’s pricing, merchandise quality, and breadth of inventory. Consumers are very price-conscious and have few reasons to shop at pricier retailers offering similar merchandise. Managing such a massive distribution network and supply chain is another major challenge new operators would need to overcome to compete with Target. The company has long-lasting relationships with suppliers that often span decades and has invested heavily in logistics to keep its shelves stocked in a timely manner with relevant products. When combined with the company's continuous efforts to take costs out of its business, Target is not going away anytime soon. Its stores are in good condition, it sells needed merchandise across nearly every product category imaginable, and the company is investing to stay relevant in e-commerce. While e-commerce has been growing faster than traditional brick-and-mortar sales for years, that doesn't mean that brick-and-mortar retail sales have been in decline. In fact, traditional retail sales have been growing at about 2% a year since 2005, along with the U.S. economy and retail sales in general. In other words, fears of a broad-based "retail apocalypse" seem to be greatly overstated today. With that said, it hasn't been an easy few years for Target, which has seen its sales growth stall and even reverse thanks to some costly missteps. For example, facing stagnant growth in America, the company launched an ambitious and costly expansion into Canada in 2013. Management pulled the plug on the project in 2015 after major supply chain problems helped generate more than $2 billion in total losses. Meanwhile, Walmart's $3.3 billion acquisition of Jet.com in 2016, which brought with it founder Marc Lore to run Walmart's vastly expanded online division, gave the company a leg up over Target in online sales. In fact, Walmart's numerous other e-commerce acquisitions (overseen by Lore) have helped drive its own online sales up more than 50% in recent quarters. So does that mean that Target is a washed up has been, with its best growth days far behind it? Not necessarily. There are still a lot of reasons to like Target, especially as a high-yield dividend growth stock. For example, while Target's size is far behind giants like Walmart, the company still has one of America's largest store footprints and a well-developed supply and distribution chain. As previously mentioned, this helps to create economies of scale that allow Target to generate above average margins and consistent free cash flow. In addition, management recently outline a very comprehensive $7 billion, three-year turnaround plan that should make it more competitive in the future and hopefully return the business to modest growth. In addition, management is well on its way to cutting $2 billion a year in costs. The company's new strategic plan involves six strategies. First, Target will invest $1 billion into optimizing supply and logistics chain, which will help it achieve its overall $2 billion cost savings goal. Next, the company will be focusing new store openings on smaller stores located in urban areas. Target has more than 30 of these locations now, but that figure is expected to increase to about 100 by 2019. Urban stores in high-density cities represent solid traffic but underserved markets that Target believes possess a significant opportunity to expand its physical retail presence in the U.S.
Third, Target is planning on upgrading and remodeling 1,000 stores through 2019. This includes not only a focus on a more upscale look, but also things like separate entrances for shoppers who are in a rush and those who are looking for a more premium, slower shopping experience. The company also wants to increase its focus on groceries and alcohol, which have proven to be a strong traffic driver in the past. To date, remodeled stores see a 2% to 4% increase in same store sales. Target is also following in the footsteps of Walmart and Costco by investing into higher pay and training for workers. For example, Target has announced it plans to raise its company minimum wage to $11 in 2018 on its way to $15 by 2020. Walmart and Costco have both shown that rising labor costs don't necessarily lead to decreased profitability, especially if matched with stronger worker training. This is because better paid and trained workers are more efficient and quit less often, resulting in lower employee turnover and less new employee training. A better workforce also tends to result in greater customer satisfaction by creating a more pleasant shopping experience that can help build brand loyalty. Further helping those efforts is the company's continued growth of its RedCard program, in which customers who obtain the company's branded credit card get a 5% discount on all purchases. Target currently has 25% of its customers enrolled in the program and has found that RedCard members tend to spend about twice as much as non-members. Management is also doubling down on its use of private label brands that are exclusive to Target (over a dozen new ones launched through 2019), and thus another reason for consumers to choose it over its rivals. Essentially, Target is trying to maintain its status as a more upscale Walmart and maintain its strong focus on higher-margin apparel and home products. However, the biggest and most important strategy Target has to return to growth is with its online sales/omnichannel strategy. This means incorporating online shopping and apps into customers' experiences in order to maximize convenience and keep shoppers from choosing Amazon or Walmart. On this front, Target launched its Cartwheel online shopping app, which now has more than 5 million weekly users, and has a drive-up delivery option in which consumers can order online, drive up to a designated parking spot, and have an employee deliver their order without ever having to leave their vehicle. But just like Walmart, Target is investing heavily in acquisitions to improve its chances of becoming a dominant name in e-commerce for many year to come. For example, the company acquired Grand Junction, a Silicon Valley e-commerce start up with an advanced software platform for incorporating online sales into traditional supply chains. Grand Junction's ultimate goal is to become a key player in local same-day delivery, which is becoming increasingly important in e-commerce. Target made an even bigger bet on omnichannel via its $550 million acquisition of Shipt. Shipt has built a nationwide network for same-day delivery of groceries, essentials, home, and electronic goods. Target plans to incorporate this network into about half of its stores by early 2018. By the 2018 holiday shopping season, Target hopes to have every single store offering consumers same-day deliveries. And by the end of 2019, it plans to expand Shipt's online delivery system to incorporate all of its product offerings. Thanks to its developing capabilities, Target is launching an Amazon Prime-like $99/year membership program that will offer free same-day deliveries. Target's membership model copies the success of Amazon and Costco, which have found that reasonably priced memberships increase consumer loyalty and spending. Note that while Walmart also offers free two-day shipping on orders above $35, it has phased out its former membership model (Shippingpass, $49/year). However, Walmart has no same-day delivery option but requires customers to pick up same-day goods at one of its 4,600 stores. Target is also planning to roll out this option eventually (by 2019). The bottom line is that Target has been around for 115 years and has proven itself highly adaptable to rapidly-changing consumer tastes and industry challenges. While it's a latecomer to the world of omnichannel, the company's turnaround plans and recent e-commerce acquisitions show potential in restoring Target's business to a path of sustainable growth. That being said, while management is busy making moves to stay relevant, there are big challenges ahead for Target in the increasingly competitive world of retail sales. Arguably the biggest risk facing Target is whether or not the company can continue generating sustainable earnings growth over the long-term. Target became a giant by filling the suburbs of America with 130,000 square-foot boxes. Growth in this industry is possible by adding new store locations and increasing sales at existing stores. In the age of Amazon, it's hard to argue that America needs more big box retailers. 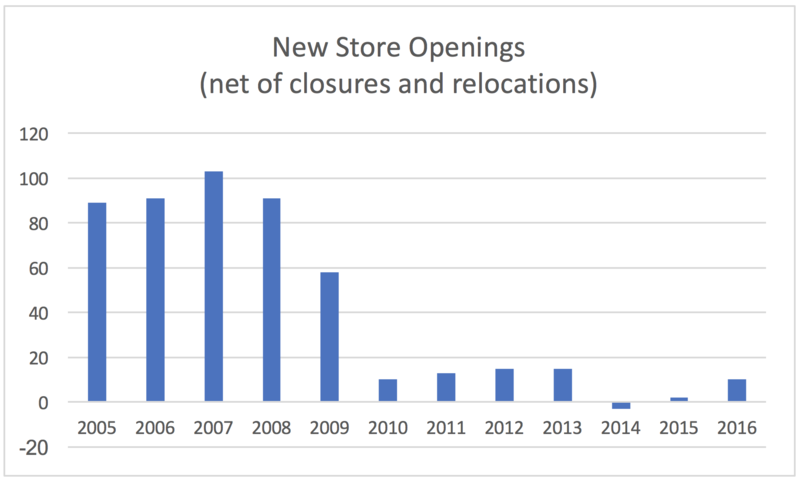 Target has faced reinvestment challenges over most of the last decade, as demonstrated by its lackluster pace of new store openings. Rather than serving as a convenient, low-cost place to shop with almost every piece of merchandise you could ever need available, big box stores have become more of a hassle today for many consumers. Shopping online is just so much easier – it saves time, provides access to every unique piece of merchandise under the sun, costs less in many cases, and makes for a convenient shopping experience from anywhere and at anytime. Brick-and-mortar retailers better have a darn good value proposition to continue drawing the masses to their stores, and traditional big boxes such as Target are seeing their core value propositions erode. Just take a look at the chart below, which shows the market share of total retail sales enjoyed by non-store retailers (white line) and department stores (blue line) since 1992. Non-store retail sales (i.e. e-commerce players such as Amazon) surpassed department stores in the mid-2000s and haven’t looked back. 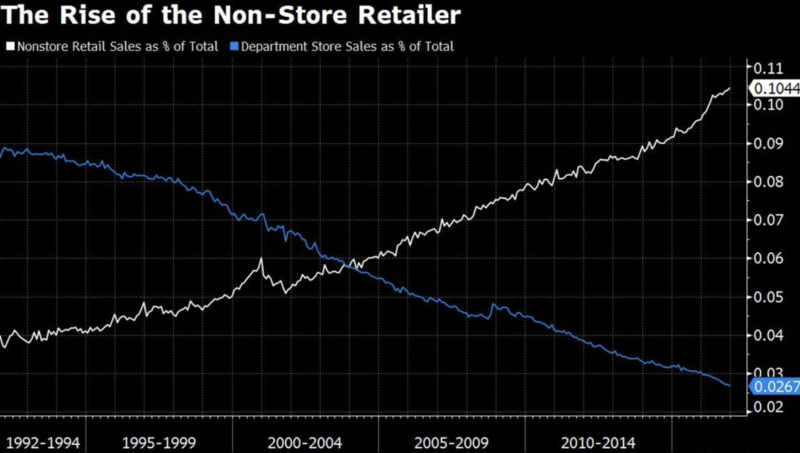 Meanwhile, department stores have seen their share of total retail sales steadily decline from 9% in 1992 to less than 3% today. Target also lacks an international presence. As a result, the company's future growth potential could be more limited compared to peers like Walmart and Amazon, who have strong and fast-growing international business units. Furthermore, keep in mind that Target's sales are likely to be more cyclical than its peers because it has very small exposure (though growing) to groceries, which make up just 15% of sales. Groceries, while low margin, are usually a strong traffic driver because they allow a store to become a "one-stop shop" that allows consumers to save time by buying everything in one place. And it may not be easy for Target to win market share in the grocery business, which continues to get more competitive. Not only did Amazon's purchase of Whole Foods trigger a price war with Walmart and Kroger (KR), but low-cost grocers such as Aldi and Lidl are both planning on opening more than 1,000 stores in the U.S. The company's rising labor costs will also make it harder to compete with low-cost grocers, and investments needed to remodel its aging store base could further weigh on profit growth in the near to medium term. Finally, we can't forget the elephant in the room, the company's struggles with e-commerce. While Target's online sales have been growing strongly, they still represent just $4 billion in annual sales, or about 6% of revenue. That pales in comparison to Walmart and Amazon, who have thus far proven more successful in their omnichannel approaches. What's worse is that Target's online business has been growing slower than Walmart's, indicating that it's likely not gaining any market share. Target's acquisition of Shipt may help it to boost its competitiveness in e-commerce, but it will be hard to win market share from Amazon and Walmart, both of whom appear to have more advanced and low cost logistics and supply chains. What about the $99/year same-day delivery service Target is rolling out with Shipt? While this holds big promise for potentially recreating Amazon Prime's success at boosting sales and consumer loyalty, keep in mind that Target lacks a first mover advantage. For example, analyst firm Consumer Intelligence Research Partners (CIRP) has been using consumer surveys to estimate how many members Amazon Prime has (Amazon doesn't publicly disclose those figures). As of September 30th, 2017, CIRP estimates that Amazon Prime membership grew by 25 million members (40%) to 90 million. With a 95% retention rate, Amazon Prime is soon going to have over 100 million members, who not only benefit from free two-day shipping but also enjoy various other perks (photos, music, movies, numerous discounts). In other words, many of Target's potential membership program customers already have Prime. Therefore, the uptake and retention figures may prove to be far smaller than the company hopes. This may be why Walmart dropped its own free two-day delivery subscription model and decided to just open it up to all consumers on orders above $35. In addition, while Target does plan to improve its nationwide distribution network and become a dominant player in online sales in the coming years, that doesn't necessarily mean the company's bottom line will benefit. Retail is increasingly a market where most cost savings end up going to consumers. That's thanks to Amazon's strategy of maximizing market share via CEO Jeff Bezos' manta that "your margin is my opportunity." In other words, even if Target is able to achieve its long-term cost savings goals and become a dominant force in e-commerce and same-day home delivery, there is no guarantee that its margins will hold up to historical levels. As a result, the company's earnings could grow more slowly than in the past and force management to grow the dividend at a pace that many investors might find unsuitable. While Target has a great track record of adapting over the past 115 years, and has certainly earned its status as a favored high-yield investment, the company has a lot to prove when it comes to its future income growth potential. However, on the plus side, investors are getting paid a generous and secure dividend while they wait for management to adapt to challenging industry conditions. Target has paid uninterrupted dividends every year since it went public in late 1967, and this dividend king's impressive payout growth streak seems very unlikely to end anytime soon. With that said, consumer retail is one of the most challenging industries to do well in. Low margins, ferocious competition, and periodic technological disruption mean that investors need to be very selective in this space. There is a reason why we have chosen to avoid investing in almost all of the retail sector – the rapidly-changing consumer landscape is just too hard to get in front of. Target's online sales-focused turnaround plan sounds reasonable and appears to be off to a decent start. However, it will put some pressure on short-term dividend growth as the company invests more cash flow back into these initiatives. More importantly, it will likely take years to assess whether or not management's actions will help Target find sustainable earnings growth in a very saturated retail market, especially as it battles against e-commerce giants that benefit from lower operating costs. Mass merchandise stores seem likely to always be relevant for a number of consumers, but it’s hard to imagine their slow bleeding and struggle to find sustainable sources of profitable growth will cease any time soon. We prefer to invest in companies that seem likely to become larger and more profitable over the next 5 to 10 years. Target doesn't seem to fit that mold, even despite its secure dividend and rich history. Investors considering Target should maintain a high bar.